We decided to give this important article a bit of a revamp as we approached winter, so we updated the article content as well as the chart itself. We removed the slightly dated PreSonus AudioBox1818 VSL, instead adding the great-value Behringer U-PHORIA UMC1820 in its place. In 2018, shopping for a good audio interface has never been easier – whether you are browsing the budget range or the premium market. Today we are looking at those units that sit somewhere in between the two – audio interfaces that can be yours for around $500 or less. What Can You Expect from a $500 Interface? In the chart below, we have highlighted a handful of the best models in this price range – all well worth your time if you are looking for a quality interface for a professional home studio. In addition, we have compiled a handy buyer’s guide just below to help you choose the right unit for your requirements. Before that, let’s dive straight into the chart! Next gen audio interface that shows how far this tech can go. One of the most versatile Scarlett models that retains a compact format. Simple design paired with Thunderbolt speeds makes for a really awesome interface. A versatile, no-nonsense audio interface that brings analog simplicity and numerous inputs. Well designed interface that is packed with solid hardware and awesome software. You won’t need to have spent much time in the world of audio gear to have heard of Roland – their mixers and keyboards are particularly legendary. However, this respected brand has produced a chart-topping audio interface in the Octa-Capture 10X10. As we mention in the full Roland Octa-Capture 10X10 review, this highly-flexible platform delivers 10 inputs and 10 outputs, with the choice of either desktop or rack-mounted configuration. The hardware inside is top tier, especially considering Roland have used mic preamps from their popular pro-grade mixers, ensuring excellent sound quality. Even at the higher price, this interface is hard to pass up! With their Scarlett Series dominating the market for so long, Focusrite show they are no one-trick-pony with a new generation of high-quality audio interfaces designed for home studio use. The bus-powered Clarett 2Pre features almost zero latency, with a powerful preamp that delivers a clear and transparent sound. Whether you are a guitar player or a passionate vocalist, this interface can be a real game changer. It also helps that the Clarett 2Pre is an attractive and robust device, that’s fully compatible with all platforms and DAWs. Be sure to read more in our full Clarett 2Pre review. The U-PHORIA UMC1820 from Behringer is a new entry to our chart and – even in this sub-$500 price range – proves one of the best value options. For users looking for plenty of inputs on a relatively small budget, this suave impact-resistant rack-mountable unit is well worth considering, with eight XLR/TRS inputs on offer. However, this is a very solid performer too – as we mention in the complete Behringer U-PHORIA UMC1820 review. It features the renowned MIDAS mic preamps, while each input has a decent control cluster (all on the front), offering good flexibility. No bells and whistles, but still great! 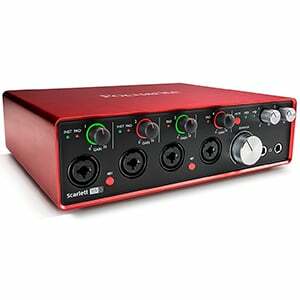 Part of the earlier mentioned Scarlett Series, the 18i8 is a very popular audio interface for home studios. With a stylish aluminum chassis, solid controls and an intuitive design, it’s a professional-grade piece of gear that is packaged into a user-friendly format. The most distinctive feature of this interface is its optical input channel, allowing you to create 10 extended channels using the ADAT input, along with eight analog XLR/TRS ports to bring the total to 18 inputs! The full review of the Scarlett 18i8 explains how the performance and durability is also top-notch, delivering a clear sound with very low-latency monitoring. A solid choice! Sitting in the lower-end of this price range is Resident Audio’s T4, whose headline feature is that it uses Thunderbolt for lightning-fast connectivity, with zero-latency – allowing you to do direct monitoring, even when you load up your signal with a bunch of plugins. In addition, the unit itself it well-built and uncluttered, with decent versatility. It comes with four XLR/TRS combo ports on the front, with decent output options. The preamps included provide a quality sound. It’s an excellent interface that packs in a lot of versatility at a reasonable price. Want more? Check out the complete Resident Audio T4 breakdown. M-Audio’s big collection of popular interfaces are among some of the most stylish on the market. The M-Track Eight proves this point perfectly, showing off a sleek, slightly retro look that we love. 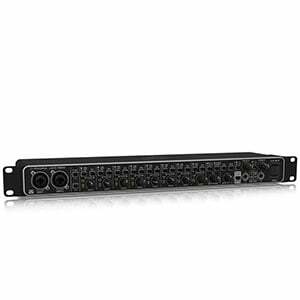 This rack-mounted interface features eight analog inputs (combo XLR/TRS ports) and just as many outputs. Every channel features its own graphic metering cluster and can be finely-tuned for optimal performance. As we highlight in the main review of the M-Track Eight, it is loaded with M-Audio’s highly-respected Octane Preamp Technology, which is some of the best on the market. It also comes bundled with some first-rate software! The respected audio software company Native Instruments are showing off their hardware capabilities with the Komplete Audio 6 – a four-channel audio interface that does things its own way. The German brand uses a standard desktop interface design, albeit with the top panel used to house controls and LED indicators, giving you an instant view of what’s going on. Under the hood, the hardware is pretty high-end and delivers crystal clear audio no matter what. Of course, as you may expect, it ships with some of Native Instrument’s excellent software, including 3GB of VSTi and other plugins. Intrigued? There’s more on the Komplete Audio 6 in the full review. So, you have found a few extra dollars to make the jump from an audio interface under $200 to something in this sub-$500 range? Excellent! You have basically doubled your options and will be able to find an audio interface that will become a very useful partner in your recording adventures. In this section there are plenty of upgrades that you just don’t find in the entry-level categories. To make this article easier to follow we will divide these features into several segments, comprising I/O options, designs, connectivity, internal hardware and software. Let’s start with probably the most obvious upgrade that $500 audio interfaces enjoy – better input and output options, which can meet the demands of busier studios and more complicated recording scenarios. Forget the one, two or four inputs of the budget categories, here you will usually find eight or more inputs as standard, with some units reaching up to around 18 inputs. It’s worth noting that these aren’t all analog inputs. For example, in an 18-input device, you’ll usually find eight standard XLR/TRS combined ports as well as 10 digital inputs such as SPDIF ports and ADAT links. Whether or not you actually need the digital I/O cluster is completely down to your requirements, but the fact that they are there makes this category very attractive. Looking at the actual design or form factor of the interface, you will see differences in this range. Up until this price point, the majority of models were designed to be used on a desktop, sitting next to your laptop and taking up relatively little room. However, now we start to see application-specific interfaces – in other words, rack-mounted designs. These interfaces slot neatly into a rack and easily screw in on the sides. As you will probably be aware if you are shopping in this price range, racks are one of the best ways to organize your audio gear and just about anything that’s not an amp or a mixer can be put in a rack these days. If you have a large studio and you are running racks, buying a rack-friendly audio interface might be the best way to go. One of the best things about investing a little more into your audio interface is the choice of connectivity. Many budget models usually run on standard USB 2.0 (with average speeds of 480Mbps), which is very acceptable. In fact, many in this $500 still use USB connections with great results. However, some of the most modern interfaces are really pushing that USB 2.0 standard to its limits. 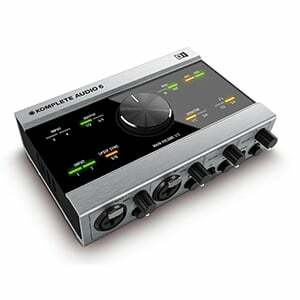 When you are sinking up to $500 into your audio interface, you will be pleased to find a few other connectivity options on offer, including Thunderbolt models. Having a Thunderbolt connection can be the difference between a good interface and a great interface, as it can offer speeds of up to 20 times higher (rated at 10 Gbps per channel). In practical terms, this translates to a much lower latency, even when you load the signal with all kinds of bandwidth-eating effects. The only downside to using Thunderbolt is that you have to have a matching motherboard. Bear this in mind when making your purchase! Of course, mic preamps and A/D converters are the core of any audio interface. As you can imagine, units in this price range tend to have much better versions of this hardware compared to the budget models. Many brands will use their flagship preamps, much like Roland with their Octa-Capture tech. They have taken the hardware straight from their most popular mixers and integrated it into the interface. If you are serious about recording music and you need the clearest recordings and the best quality possible, having a top-notch preamp matters. When it comes to recording audio, the software you use is half the experience. Most of the models on our list come with at least one DAW, as well as a whole array of additional plugins and other goodies. This can be real high-end software, which can help turn your recordings into something very special. It’s unlikely to be a deal-breaker (especially if you already own your own DAW), but be aware that the software and extras on offer in this range really hits the spot. The best thing about audio interfaces is how they tend to scale naturally. Those in the affordable entry-level range are awesome for smaller home studios, and – as you work your way up – you start to see devices suitable for professional use. The models we have listed above are a great example of pro-grade audio interfaces. With both desktop and rack-mounted units, USB and Thunderbolt devices, we hope our chart has given you a good idea of what’s out there in this range as well as a bit of inspiration. Whatever you eventually go for we hope it gives you years of trusty recording pleasure!